Hey guys! In light of all the conversation that’s been going on since yesterday’s GAMA reveal, Crystal and I thought it’d be a good time to record another episode. We were initially going to name it Games but decided that wasn’t quite suitable because, as some of you may have heard, several people saw a rough version of the Ender’s Game trailer yesterday and it wasn’t us. If that’s not a good reason for a pity party, I don’t know what is. The trailer – We discuss the Cryptozoic reveal and what we do and do not expect to see when the teaser is made public. The poster – This will definitely show up before we see a trailer, right? Where’s the poster? We hope you guys enjoy the episode! It’s very lighthearted compared to last week’s OSC controversy chat, even if we were feeling a bit jealous. Happy first day of spring, everyone! Make sure you check out EnderCast on Facebook and Twitter — and be sure to let us know if you’re interested in being a guest on the show! Movie trailer content — They’d better not give the whole ending away. And I don’t think they will. But they do need to set up the basic situation and/or conflict. Will that be the conflict between Earth/humanity and Buggers/Formics (a pretty ominious and dire situation, to be sure)? Or conflict between Ender and the teachers/IF/Graff? 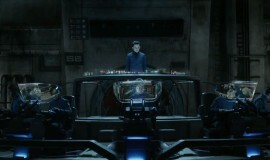 Or conflicts between Ender and other students/soldiers? Or deep-searching-inner-moral conflicts of Ender’s heart and mind and soul? Um…by “that one Matt Damon movie” where he plays a spy …. are you talking about the Bourne Identity movies? Moises Arias pronunciation — I don’t know how *he* says it, but in general in Spanish you’d pronounce it essentially how you both did, but with the emphasis on the second syllable rather than the first — Moy-SACE. Poster ideas — Have you seen all the poster ideas by Darian Robbins posted over at Ender’s Ansible? Some good ideas, and a number of them feature the entrance to the Battle Room. If you’re going for something iconic from the movie — something unique that will differentiate the movie from all the rest, as well as something awesome that book fans will drool over — the Battle Room might be it. Yeah, there’s a war with aliens. Yeah, there are kids (young teenagers) in space. Yeah, there’s technology and sci-fi-ness. But the Battle Room. That’s what Battle School is all about. That’s even what started the entire story in Orson Scott Card’s mind (see the Intro to the Ender’s Game book). That’s iconic and awesome. And movies generally have a tag line or two. Something short and snappy to quickly describe/brand it in people’s minds. The obvious and famous line from the book is, “The enemy’s gate is down.” Fans will go nuts. Sooooo cool to see that on a poster. But will it be meaningless to those who haven’t read the book? Or will it be mysterious but intriguing enough that A) it’ll stick in their minds, and B) they’ll want to know more? Or maybe some tagline about children being trained to save the world. Or Ender being humanity’s last hope. Or being a genius. Or something. Great podcast series, by the way. I recently discovered your sites, and I’m haphazardly catching up on … everything. I think I’m slightly addicted. Thanks. Regarding the trailer: I have full faith in Summit’s ability to not give everything away. The thing is, since WE already know everything, sometimes it SEEMS like they’re giving stuff away when what they showed means very little to Joe off the street who hasn’t read the books. We read too much into things because we already know what’s up. You know what I mean? I really am hoping that they go with “The enemy’s gate is down” for a tagline. You’re exactly right: fans would go nuts and everyone else would find it intriguing, I think. But we’ll have to see what they do. With the first teaser poster coming out today, they might have included a tagline… at least, I hope! Looking at his IMDB page, I think the movie I was thinking of was The Good Shepherd, but I don’t think that was actually the trailer I was thinking of.